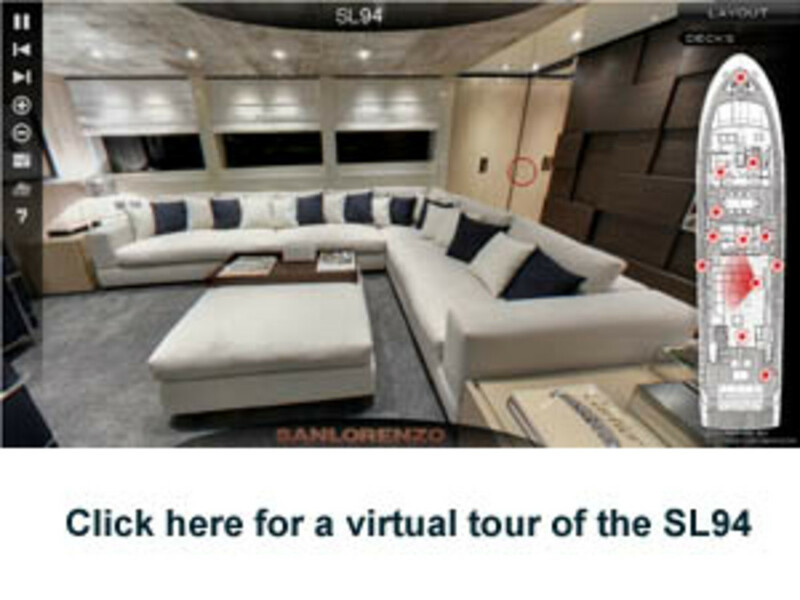 Sanlorenzo’s SL94 uses technology and design to bring back the elemental nature of boating. 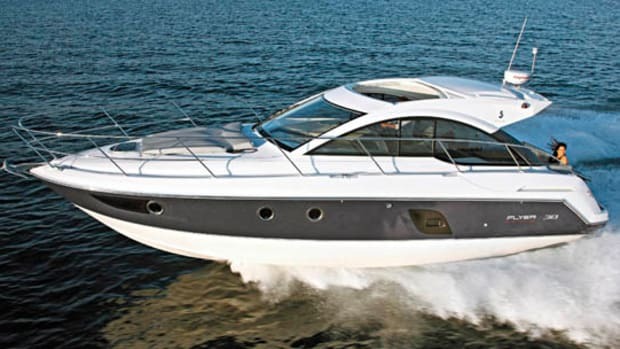 The pure idea behind a boat is very simple: To cross a body of water safely. Over time, we’ve added requirements to that basic concept. As our voyages have expanded to include such needs as exploring beyond the horizon, catching fish, or wowing them in St. Tropez, designs have grown and changed to meet our demands. But lately it has begun to feel like the boats are making the demands, and we’re the ones struggling to keep up. Just as a smartphone user can learn to feel a sense of overload at the ping of an arriving e-mail, so have boaters begun to feel like they’re sometimes serving the technology that was invented to serve them. But just when all seems lost, there arises a glimmer of hope. 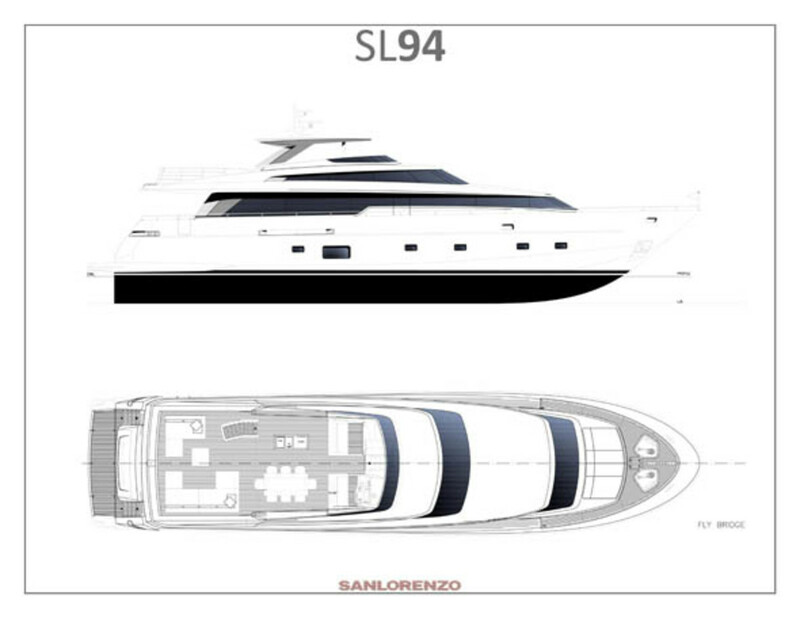 The Sanlorenzo SL94 may be an indication that the pendulum is beginning to swing the other way. Here’s why. If you happen to go out for a ride on the SL94 on a glorious spring day as I did, with a group of people who are getting to know each other, you’ll soon notice something interesting. The attention-getter is not the conversation itself, which inevitably gets louder and more animated the faster the boat goes. It’s the moments in between—when no one seems to feel the need to speak. That’s when you realize how quiet the boat is. To do our speed runs—a rare treat on a boat of this size—I got situated at the lower helm out of the wind and far from the madding crowd. We left the companionway open, so the skipper (who drove from the upper helm station amid an appreciative audience) could hear my requested rpm levels for the test. 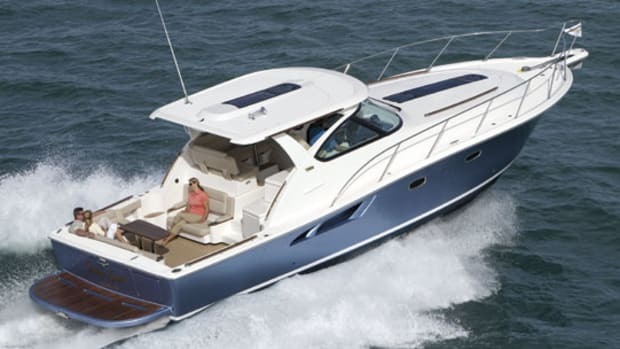 As the SOG readout on the Raymarine G-series showed, the boat was accelerating rapidly through the teens and into the 20s. My sound meter would jump as I called out each successive rpm level. Then it would drop right back down. I was loud. The boat—with decibel readings below the level of normal conversation for the most part—was not. 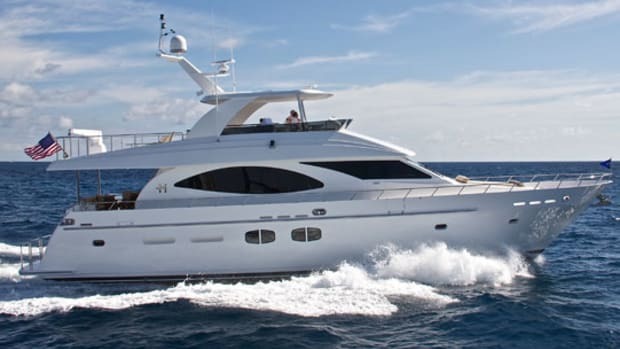 Sanlorenzo seems to understand that the comfort of a yacht’s passengers and crew is paramount, and as most of us long-time boaters know, noise and vibration can be exhausting. 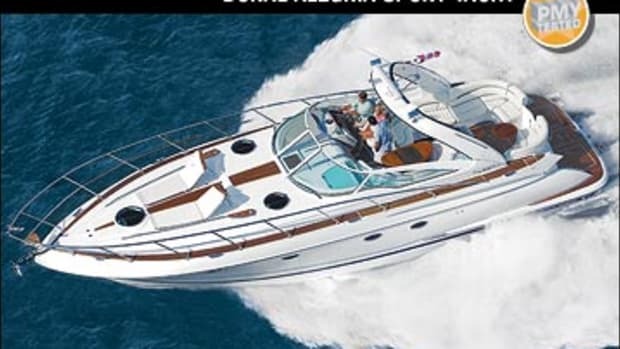 The sound-deadening and vibration-reducing technologies I enjoyed on our test boat were emphasized early in the design. 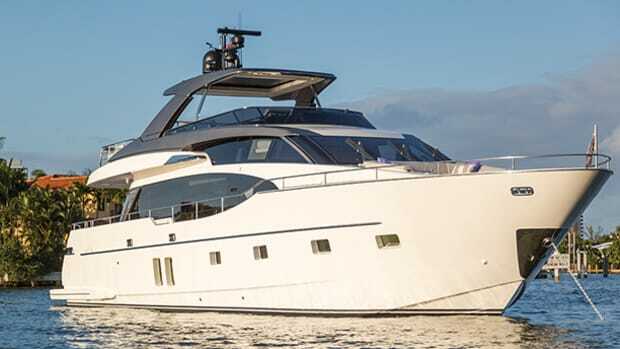 “In the aft part of the hull, the SL94 has two tunnels designed to reduce the shaft-line inclination, reducing vibration and, more importantly, aligning the hull with the propellers in the best way,” says Andrea Guido, a project manager for Sanlorenzo. “Under the gearboxes, we have mounted a new damping treatment to reduce the vibrations next to the shaft-line interface.” Combine these features with accommodations damped with rubberized mounts and insulated from the hull and the machinery spaces and the resulting quiet ride will put you in the mood that initially brought you to the sea and keeps you coming back. Exhibit B is the crew’s quarters, located forward on the lower deck, down a flight of stairs from the galley. Upon entry, you notice that nothing is different—the area is finished to the same level as the rest of the boat, though the passageway is narrower. The idea: Keep the crew happy, and everyone’s happy. And the concept of the SL94 is indeed a recipe for happiness—to provide a blank semicustom canvas where you can have what you wish. Just be prepared to answer some questions: Want the galley up? A main-deck master? How many guests will you have? Our SL94, hull number two, had a formal dining room between the saloon and the galley, but yours won’t if you don’t want it. 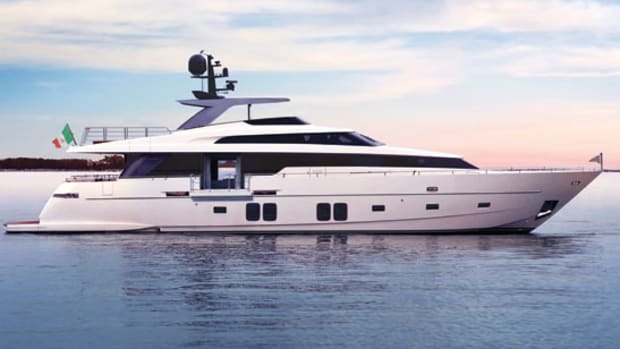 Beyond a few structural bulkheads, it’s up to you to fill that overall envelope with the features and flow that you sort out with Sanlorenzo. 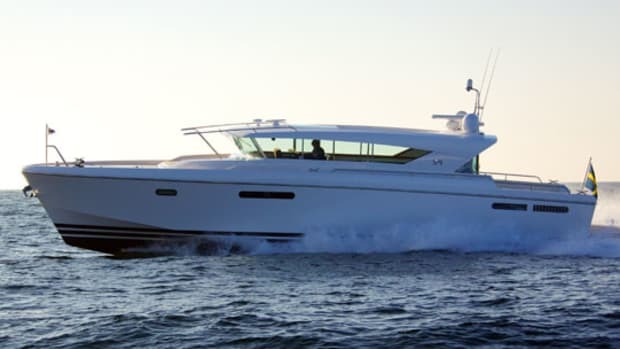 The bones are there, and the muscle: Twin 2,300-hp MTU diesels move this boat right along. The SL94 isn’t a surface-drive speedster, but our test boat flirted with a make-that-dinner-reservation-in-the-next-port top speed of 27 knots. 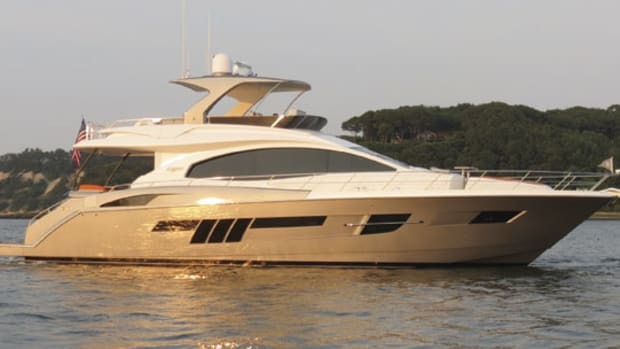 Sanlorenzo is equipped to accommodate its customers with a selection of models. Can’t get all you need into a 94-foot design? You may need to bump up to the SL104. 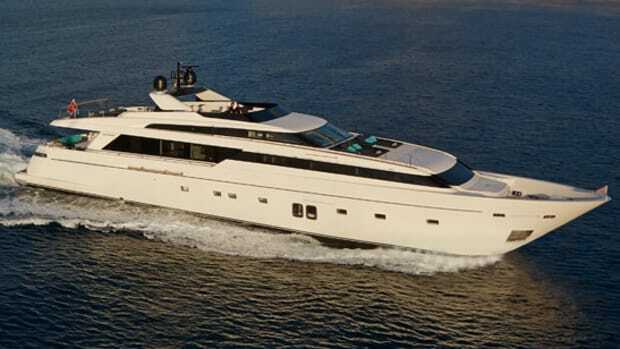 Sanlorenzo has a broad range of sizes in the SL series from a 62 up to a 108-footer. 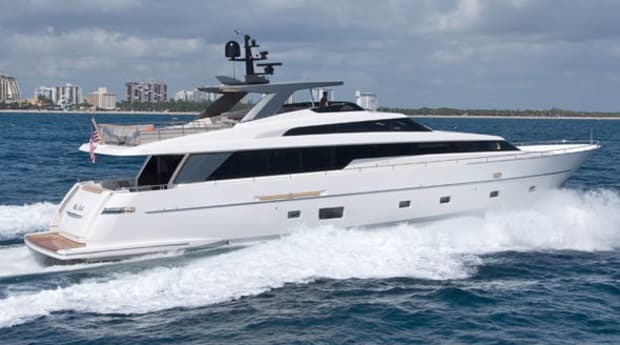 The company also has semi-displacement designs, heralded with “SD” in the model name, starting at 92 feet and going on up into aluminum- and steel-hulled megayachts at 131 and 151 feet respectively. 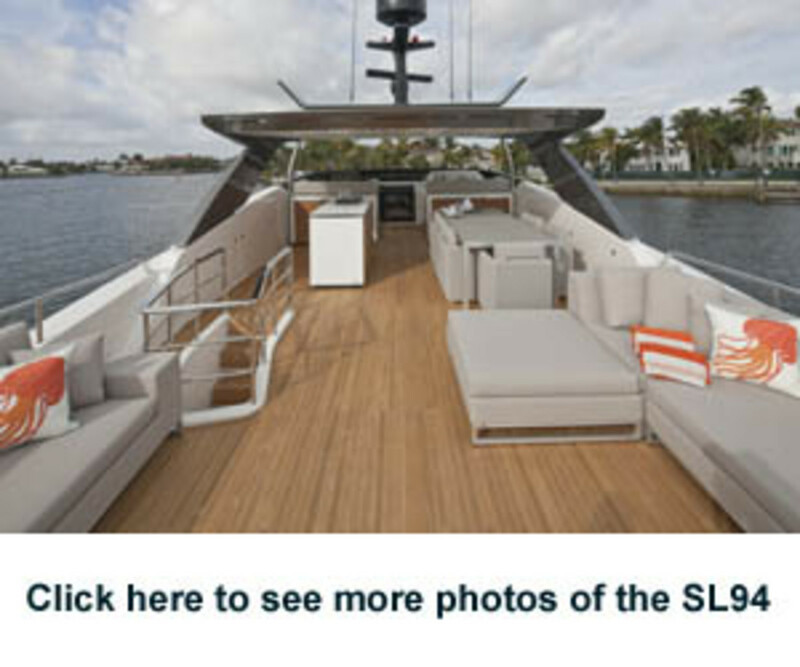 The interior of our SL94 felt like a sleek and modern interpretation of a summer cottage. She was built on spec by George Jousma of Sanlorenzo Americas with a décor imagined by Marty Lowe who emphasized neutral tones—beiges, ecru, and soft whites—that have a calming effect. “The inspiration came from that piece of coral in the saloon,” Lowe says. “I picked it up on the Amalfi coast somewhere and carried it home. 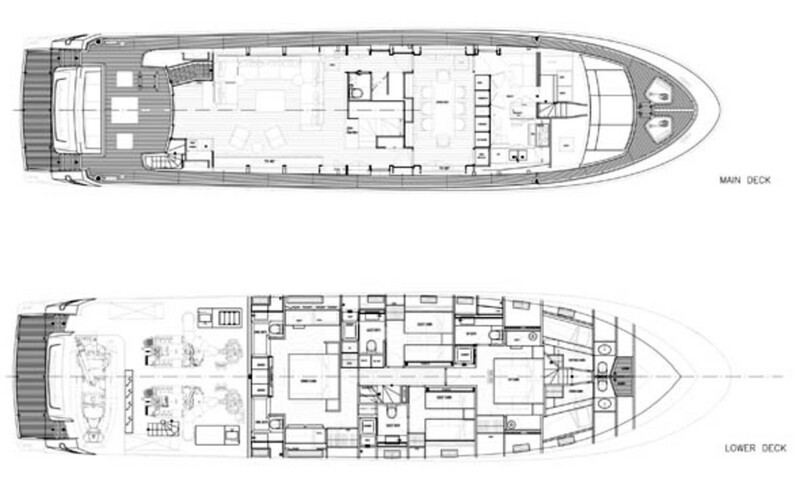 In yacht design we’ve gotten so far away from the sea. It’s gotten so residential that I like to celebrate the sea and all things that have to do with the sea.” But the sea isn’t some flat object you hang on a wall and moon over. “You feel it,” she adds. The interior is finished in wood and stone. Or two kinds of wood, in fact: A whitewashed oak and a darker walnut with a machine-carved surface so subtle you barely notice it, until you slide your fingertips across it. “Everything I do is always very tactile,” Lowe says. “I like to touch and feel things. The walnut has a linear carving in it that picks up the coral again and it picks up the way I treated the marble in the master head.” The stone is a white marble from Italy that Sanlorenzo has installed with a machined finish in the master head shower. The marble is left unfinished in some areas though, such as the slablike main saloon bar. Exterior deck spaces also benefit from smart design: A garage houses a 14-foot tender, freeing up the flying bridge for a huge entertainment space and some sleek, modular Minotti outdoor furnishings. Those who enjoy entertaining will love the Boffi cabinet on the flying bridge, with its sliding top surface that conceals a sink. You get the amenities without giving up counter space, a resounding si to Italian design. That Italian design sense shows up again in a striking polished-chrome grid structure at the forward end of the main saloon. This rack separates the room from the stairwell and dining area forward. It has rungs wrapped in brown leather, and some of the spaces are backed by mirrors. It’s a challenge to describe the effect: It breaks up the end of the room and creates an illusion where you can’t tell if you’re seeing through it or seeing a reflection of the room. But tucked behind the grid, next to the staircase down to the lower deck, is a Zen garden, with sand and a rake, and stones and shells. It’s a no-tech amenity that needs no explanation. And it may be a good place to bury that smartphone while you’re aboard. Generator: 2/Onan, 55 kW each, LWL: 77&apos;4"
2,098 gal. fuel, 488 gal. water, 10 persons, 200 lb. gear. 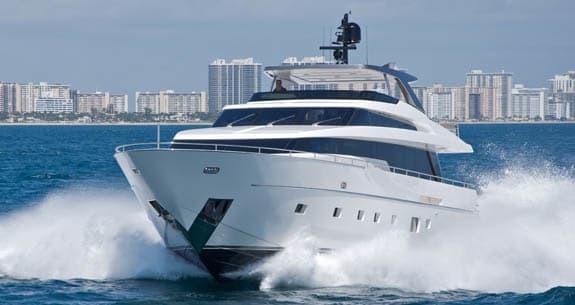 This article originally appeared in the July 2012 issue of Power & Motoryacht magazine.